Get off the beaten path in Malaysia’s Langkawi Archipelago and explore 3 amazing waterfalls in today’s article. The island is a UNESCO-listed World Geopark and offers pristine nature and stunning scenery. Langkawi, Malaysia is known for its incredible beaches and dense rainforest, making this destination perfect for a family vacation. 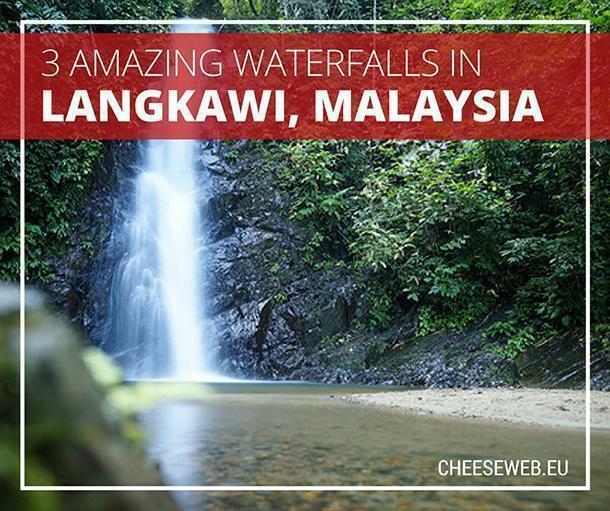 After you’ve relaxed on the beaches and trekked through the jungle, why not get off the tourist trail and visit Langkawi’s few but beautiful waterfalls? 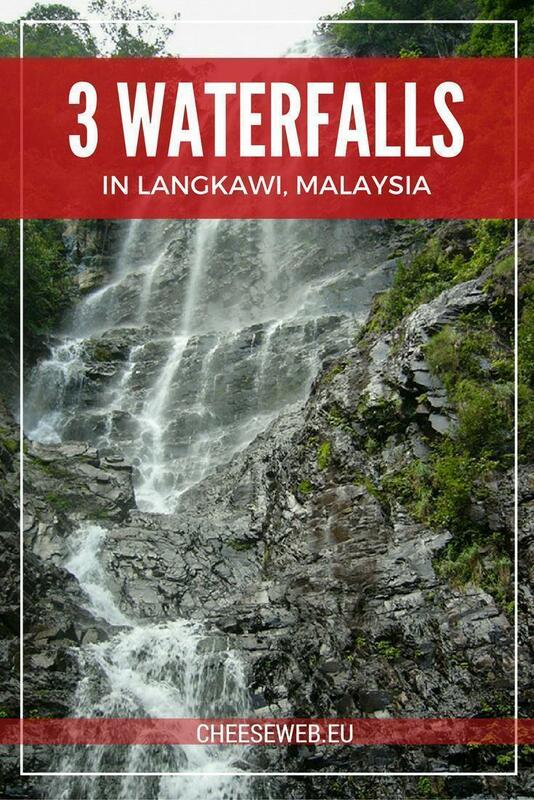 As you might expect, Langkawi’s waterfalls tend to be shallow during dry seasons, therefore, try to visit the falls during the rainy season (September-October). The Seven Wells Waterfall, locally known as Telaga Tujuh Waterfall, is renowned as one of the top natural attractions in Langkawi. Its name, Telaga Tujuh, refers to a series of seven ponds (or wells) from seven different falls in Mount Mat Cinchang. A local legend says the waterfall is home to fairies with healing powers, and the water here will cure your illnesses. If you are feeling adventurous, you can brave the climb up the steep cliff to the top of the falls, which takes about 45 minutes. 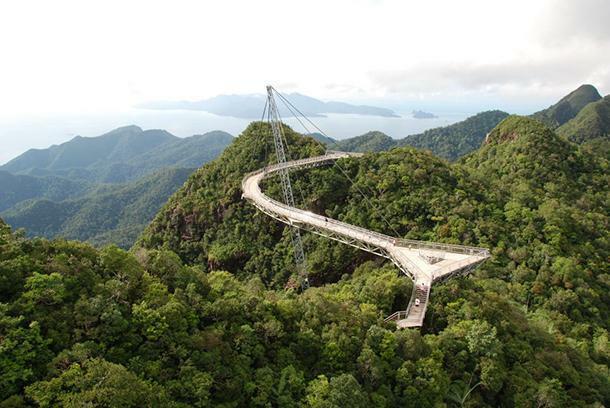 Along the way, you may encounter a few of Langkawi’s wildlife species like macaques, squirrels, and hornbills. Air Terjun Temurun or Temurun Waterfalls’ waters cascade 30-meters below, to the northern valley of Mount Mat Cincang, before reaching Datai Bay. Visitors who want to see the waterfall up close will have to descend steep slopes, for about 10 minutes. 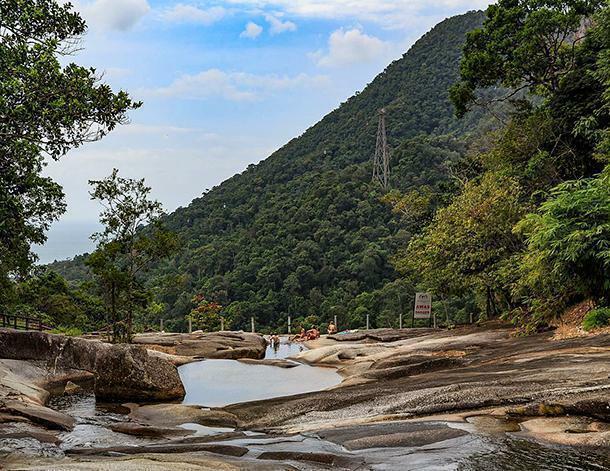 Visitors can swim here in one of Langkawi’s most stunning natural pools. Visit the waterfall during the rainy season for maximum effect, pack some sunscreen and extra clothes, and enjoy the falls with your beloved for a relaxing weekend away. 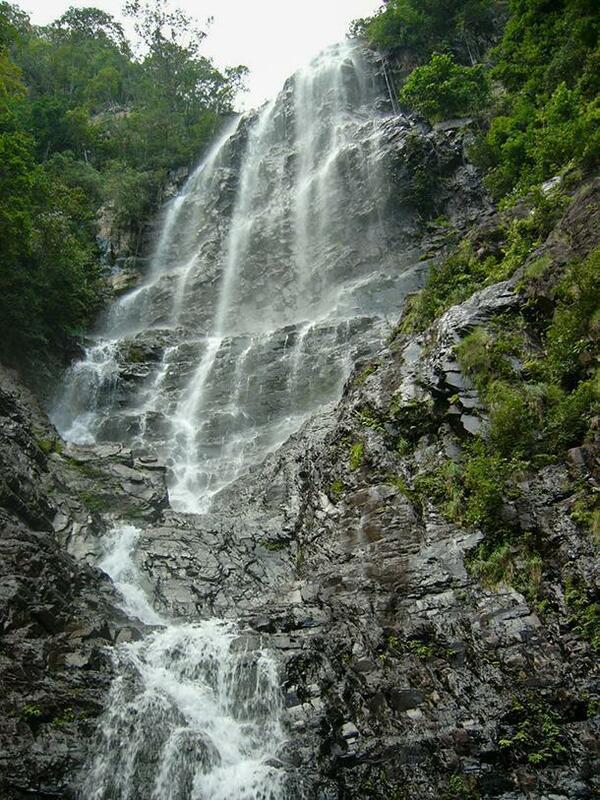 Another must-see waterfall in Langkawi is the Durian Perangin. 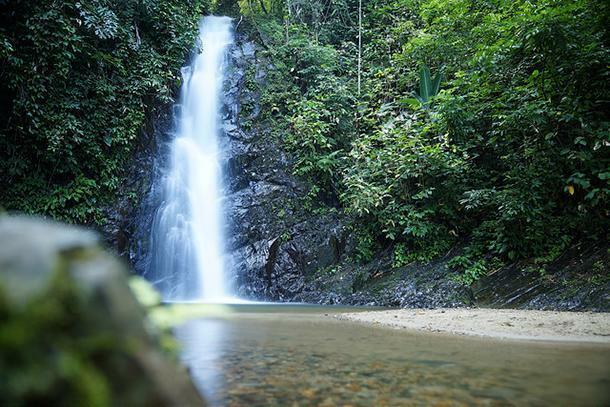 This tranquil waterfall is named after the Durian trees that flourish nearby. Durian Perangin Waterfall is located in northeastern Langkawi, surrounded by lush greenery and natural rocks formations. This 14-tier waterfall tumbles down Mount Raya, the highest mountain on the island, into a crystal clear lake at the bottom. Visitors can also discover plant species such as tropical wood and vines like Melunak, Meranti, Rattans, and Temak. During weekends, you are most likely to encounter big groups of travellers, such as families or work outings, so if you are planning to enjoy the silence and listen to nature, try to visit during weekdays. 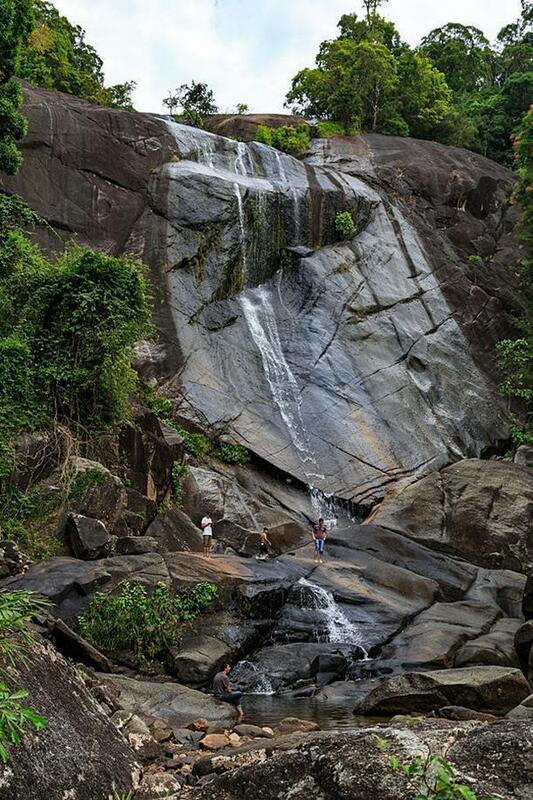 The best thing about Langkawi’s waterfalls is they are all free to visit. There is no better destination to enjoy both family picnic or a romantic escape. 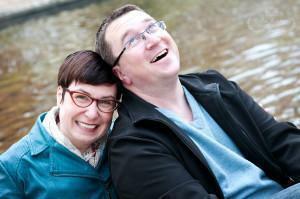 The trek may be difficult, but these challenging walks are what bring people together. The scenic view of the waterfall and the serenity you feel just by experiencing it can de-stress your hectic travels. Now that you have your free itinerary for visiting Langkawi’s best waterfalls, it’s time to figure out where to stay to enjoy Langkawi from the falls to the beach, or even to enjoy some duty-free shopping. Book your Langkawi hotel on Traveloka and be sure to check out the Geopark Hotel in Oriental Village. The hotel is set amidst the foothill of Mount Mat Cincang. This hotel features 30 modest rooms with air-conditioners, free WiFi throughout the hotel, and free parking for guests. Suites are available with a separate living area, while budget travellers can opt for dorms with bunk beds. It also features an outdoor pool, with a spectacular view of the Mat Cincang Cambrian Geoforest Park. The hotel is 700 meters from Telaga Tujuh Waterfall and 12 kilometres from Langkawi International Airport. Geopark Hotel Oriental Village is located at Oriental Village, Block C, Teluk Burau, Langkawi. Rates starts from RM 98 per night on www.traveloka.com. Occasionally CheeseWeb partners with other companies to bring you content from areas we’ve not yet explored ourselves. Although we haven’t visited these places ourselves, we do check the information and ensure it meets our quality guidelines. We hope you enjoy these kinds of articles!